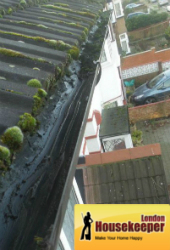 Picture your gutter cleaning in London taken care of with no hassle or stress. Imagine a service that's simple to book. That you can rearrange easily. And which comes to you performed by fully insured technicians using the latest equipment. Housekeeper London is your local choice for high-quality guttering services. The Gutter Vac Clearance tool we use means we'll never need to use ladders near your property. So you can relax while your experts get to work for you. Get a free quote on your service now. You'll find someone ready and waiting to help you 24 hours a day, every day of the week. You can actually see the result. There is a camera attached to our equipment. 020 3746 2485 is the number to use to reach our 24/7 phone lines. You can set up an appointment with your London gutter cleaners at any time of the day or night, and it's also quick and simple to do so online via our form for free quotes or the chat facility. Q. How exactly does your equipment work? A. Our Gutter Vac Clearance system is essentially a large, hardened, and more powerful version of the vacuum cleaner you have in your house. Using the system's fitted camera to see what they're doing, your team will use the device's powerful suction to extract all leaves and debris from your guttering, and all downpipes above the ground. Q. Will it be able to reach my gutters? A. The system is suitable for properties usually up to four stories high, as the machine's extendable pole stretches up to ten metres in length. As long as we have access to the base of your property, we'll usually be able to reach your roof, unless you're in a high-rise building. Q. Can you show me the results you've gotten without me needing to climb up there? No problem. Simply ask one of the team taking care of your work for you for a glance through our system's mounted camera. But whatever you'd like to know, simply give us a call to get started with your booking or get the information you need at any time.